D'Anastasio describes her typical goblin encounter: "The goblins appear, as they always do, in tattered clothes and with knives or maybe little shortbows. They are small, green and pointy-toothed. They are produced in a factory, I think." This likely rings true for a lot of tabletop players - goblins are almost always described in a boring and dull manner and exist only as an after thought on a random encounter table or as a default low threat opponent. There's a lot a good GM can do to prevent this - none of which 5th edition seems to want to clue it's players in to. A. DON'T CALL THEM GOBLINS - It really is this simple. 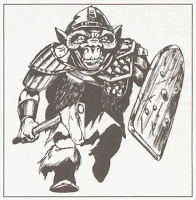 "Goblin" brings an immediate image to mind for any RPG player, or really almost anyone exposed to popular fantasy since 1974 (see NOTE ON VANILLA D&D below), weak, small, variously ugly and likely green. More importantly though "Goblin" is a name that defines an enemy as weak, easily defeated fodder. I still pretty much remember the goblins stat-line from the 1981 Basic Set and the specific mechanical aspects of a potential foe is the last thing one wants players to be thinking about when they start an encounter. Even for players that don't have the details memorized from past experience, the cultural baggage that the word 'goblin' carries sets one's goblin encounter down a well trodden path. This is why a decent GM will never describe a monster by the name in the Monster Manual, but rather describe it in some detail on the first encounter and either adopt a player generated name or something neutral (e.g. little green rat-men) and unrelated to a Monster Manual name upon subsequent encounters. Players shouldn't immediately know the danger they are faced with and descriptions of fantastical beasts should ideally evoke wonder. The Monster Manual descriptions of any creature, especially in 5E, are largely mechanical, and the illustrations usually that profoundly uninspiring lowest common denominator derivative sort of fantasy art. Because of this, and as long as one doesn't stray too far from the mechanical aspects of the enemy in combat, everything else can be changed, modified, reskinned or transformed without serious work. It is a fundamentally lazy and bad Game Master that doesn't figure out how their 'goblins' are different, why they are different and how that effects the game and it's fundamentally lazy and bad adventure design when a published product doesn't do it. This is one of the gripes I have about Lost Mine of Phandelver and other WotC published adventures, they seem to think that an encounter is mostly found in the mechanics of a set piece combat rather then description, wonder and fiction. Referring directly to a monster manual or otherwise reducing an encounter to a line of statistics without some evocative nugget of description is a real waste of an encounter. Nor is making mechanically simple enemies interesting through description, or even making them frightening especially hard. 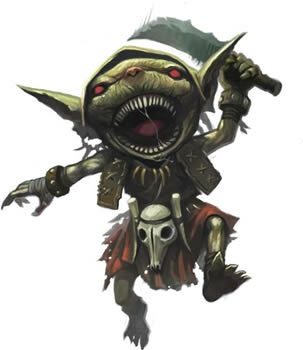 With goblins all the GM need retain is that they are small fairly weak and intelligent (to what degree is less important) - their appearance and description can vary wildly. There's really very little limitation on how one can describe a "goblin": fey changeling children, blue hairy muppet things, bipedal mole-rats with human hands, pack hunting versions of the Weekly World News' famous "Batboy", spindly fairy tale creatures that steal teeth or broken haunted toys - whatever one likes and whatever best fits ones setting and adventure. B. SHOW DON'T TELL - As D'Anastasio suggests making encounters hold clues, information and evocative detail can make them more interesting. While the joke of the orc shouting "Gothrog No!" as the party cuts his companion down and the dying orc replying "I'll always love you Goreax!" is a classic in making your players question their murderous approach to everything(and really not a terrible way to explain a passed morale check either) might not be the most meaningful or interesting, something that enlivens a combat (even a bland one) with details and provides a larger meaning is a worthwhile tool in the GM kit. This suggests a principle of adventure design - that encounters are best when they fit into a location. The heart of D'Anasatsio's complaint isn't really that goblins are boring - sure they are, but the problem is that fighting them in Dungeons & Dragons is a boring waste of play time. I'd propose that this is because fighting a small group of goblins (such as the paltry gangs in Lost Mines of Phandelver) is nearly risk free for the players. That is a party of adventurers in direct 'Rules as Written' combat (that is without the tactics of 'fictional positioning' such as ambushing the enemy from above, or adjudicating the effects of a novel effort to frighten the enemy by pretending to be a ghost) will massacre a group of goblins without significant risk of injury, depletion of resources or need for attention. This is a dull situation that feels like a chore and wastes valuable game time, but really there's only one way to resolve it - to make every encounter risky in some way. Make every encounter either offer a risky opportunity or threaten something that the party cares about, not necessary the lives of their PCs, but something. A. GOBLINS DON'T LIKE TO FIGHT - Let's assume that a group of goblins (or similar runty but not unintelligent creatures) knows that it's near the bottom of the dungeon food chain. Why then would such a group of creatures launch itself at a marauding gang of heavily armed, magically potent adventurers? However little goblins value their lives they must place some value on continuing to survive - and engaging in direct face to face combat with powerful enemies seems like something they should know isn't conducive to survival. This isn't to say that every group of enemies weaker then the party or suffering from feelings of inadequacy should flee immediately, the hungry beast might try to grab a single victim and flee, and the the intelligent creature might engage in a wide variety of behaviors to benefit itself at the expense of the party. What's needed is expanding the palette of encounter options. With 3.5 and 4th edition as it's guides and the school most of its designers learned in 5e often takes the approach of these editions and maximizes the possibility and desirability of combat as the goal of the encounter. Perhaps its having written up specific rules for "CR" or perhaps it's just laziness, but again - goblins don't want to die, and unless they think they can win or are hopped up on some really good mushrooms they do not "Attack Immediately". In the past reactions and encounters (unless the enemy got surprise) were dealt with via a reaction roll, a test to see what mood the monster was in and how disposed to violence over chat it was. This roll often emphasizes interaction and parley over combat, and it's one reason why knowing monster languages was useful in early game editions. Intelligent enemies (or unintelligent one with certain behaviors) can attempt to do many things other then fight: make noise to draw more dangerous enemies, attempt to bully and rob the party, offer to help the party and lead them to betrayal/traps, try to steal from the party, attempt to encourage the party to fight their enemies, offer to aid the party for money, view the party as rescuers and try to enlist their help in earnest, flee into the darkness, offer maps or other advice in exchange for escape, tell rumors, try to get the party drunk. Really the list is endless, and each of these options is far more interesting then a fight that the party will triumph in without risk after wasting 20 minutes or more of play time. B. SWORDS ARE ALWAYS DANGEROUS - The use of monsters purely based on their mechanical purpose (and role) became popular with 3.5 edition D&D and carried over into 4th edition with it's carefully balanced tactical battles ('CR') and monster combat roles ('Brute', 'Controller' etc.) and this method of 'encounter design' may function when the locus of play is tactical combat between an antagonistic GM and players, meant to be mediated by strict adherence to the 'Rules as Written', but it feels artificial, clumsy and unsatisfying when playing an exploration game, and when the combat itself is boring, its end virtually predetermined and without any larger meaning. This appears the mechanical gist of D'Anastasio's complaint about 'goblin fights' (entirely independent of issues with initiative), and if one wants to play D&D as a tactical combat game I suppose the answer is to never create a combat encounter without risk for the character. In the early editions I favor, combat is almost always dangerous to the party and the mechanics very quick and simple. It doesn't matter that much if one is a 6th level and one's enemies are a pack of 1st level goblins, they can cause injury, reduce HP and waste resources. If the weak enemies get lucky and concentrate their fire well they might even inflict serious injury or kill a PC. Of course in this sort of game combat is not rewarded with experience and is almost always considered a failure by players. With these sorts of mechanics, 'goblin encounters' simply don't happen much, and when they do they are over very quickly. In 5th edition, creating dangerous encounters with weak enemies may be hard. It's a system designed to give even low level characters a great deal of survivability and the ability to dominate combat situations with an assortment of powers. It's also complex enough that even short combats take up a considerable amount of play-time. For a scene based combat-centric game I don't really have a solution, except to throw dangerous enemies at the party in dangerous situations (an ambush on a lava bridge or something) - and with goblins I suppose this might mean taking a page from the wretchedly antagonistic, but creative GMing of "Tucker's Kobolds", and placing weak opponents in advantageous situations. If one isn't running D&D as a series of complex combats, the answers above about demphasizing combat within over-leveled encounters may serve better, but adjusting intelligent enemies (like goblins) tactics also makes sense. Hopefully a combination of evocative monster description, organic/naturalistic encounters that potentially provide detail about the location, faction play and tactical novelty that creates risk are solutions to boring 'goblin encounters' even for new groups and GMs. It's not hard to be creative about what enemies that party faces, and the world one is building to play in, and this sort of creativity is the core of a good tabletop experience. Goblins Never Change - They Should! While D'Anastasio's article is great to see, both because it shows the growing popularization of D&D and because it suggests that even people playing the most mundane and soulless sort of D&D - the settings and adventures adapted directly from WotC's published materials are thinking about the game, and being creative in their efforts to improve it - the essence of what makes Tabletop Roleplaying fun and interesting. Unfortunately the folks coming to 5E and Forgotten Realms are held back in some serious ways. 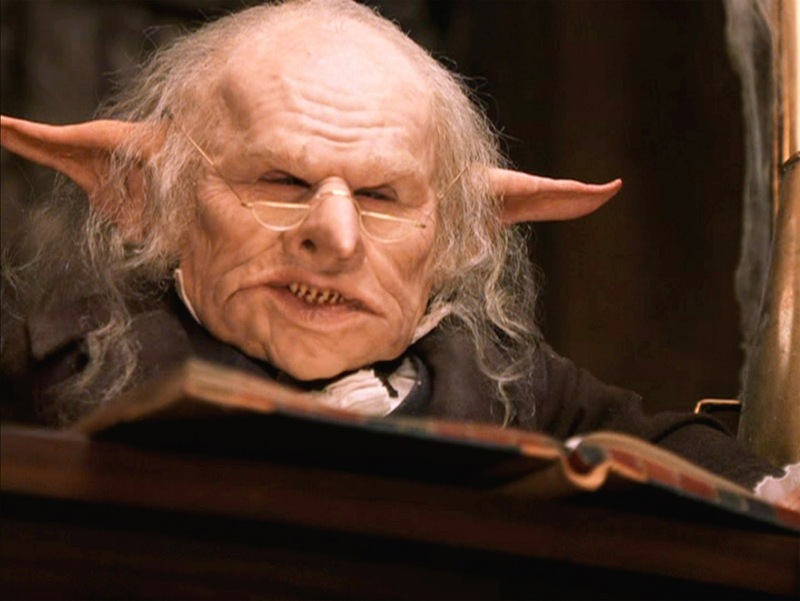 Above I noted that D'Anastasio has suggestions and wants to make her goblins interesting, but doesn't suggest the easiest step of redefining what a goblin is, reskinning and describing them as something horrible and unknowable. Like many who are new to the game, the lazy implied setting of Forgotten Realms seems a fixed idea. Goblins are already defined as a pointless fight, a monster that takes up time without meaning, something subject to "grinding" rather then a legitimate element of a collective storytelling game. I'd suggest this is because the idea of goblin has been refined and clarified in the years since the Little Brown Books came out. Popular culture now knows the distinction between orc and goblin, a distinction that in 1974 was esoteric and unclear even in it's source - Tolkien. 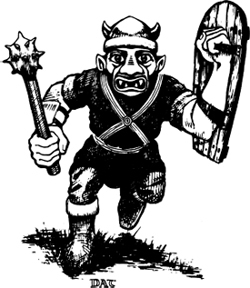 A lot of this distinction began with the codification in Gygax's D&D, from where it entered the childhood taxonomies of an entire generation of future creators: video games, films, novels, comics and all things fantasy are informed by the collective understanding that a goblin is a 1HD-1 monster with an AC of 6 - an annoyance and the weakest foe on the ladder of true humanoid enemies (kobolds are strange, partially due to the affection they get as little dragon men, partially because of the infamous "Tucker" linked above). This view of the goblin has filtered back into D&D, making the goblin a 'fodder' enemy, something to be ignored and maligned. Vanilla D&D doesn't examine this issue, it doesn't try to interrogate or contemplate the wonder and potential terror that is implicit in a small horrible person/not-person thing trying to kill you with a rusty knife in a dark cave. I remember my first session of D&D - a foray into the kobold cave in B2 - Keep on The Borderlands. My Fighters Fred and Charlie leading the way, our party was attacked by a swarm of "Giant Rats". It was 1983 or so and as a small child I'd never heard of a giant rat, but with a few bits of description from a likewise youthful Game Master (nothing special: red eyes, naked tails as long as an arm - that sort of thing) the idea of huge hungry rats was terrifying - as it still should be if one contemplates how one might react to a doberman sized sewer rat ambling in from the kitchen. The rats were backed up by a band of tiny orange rat people, who were angry at our slaughter of their "cows" when we tried to talk to them, and refused to be mollified by offers of peace due to their rage at the dead livestock/pets. The GM may have been better then I give him credit for, because I still think of kobolds as surviving on a rat cheese based diet, and at the time it all seemed very wondrous, a bit frightening and compelled me to play more, just to discover what else might be down in that kobold burrow (which I thought of as looking rather like a gopher tunnel). Vanilla fantasy in many ways robs players of these sorts of moments, in smothers wonder, because it views the game world as set, quotidian and fully comprehensible without complexity. For example, magical healing may be commonplace, but the issues of access to it or its effects on urban growth and mortality rates are never examined or touched on. Vanillia fantasy dumbs down and drains the fantastic of wonder, both by sticking to now cliched imagery and by asking its consumers to passively interact without examining the strange possibilities that it's assumptions generate. Tabletop games, because they aren't per-generated content offer a unique opportunity for their players to step past or through Vanilla fantasy's limitations and to bring in whatever elements they with or can imagine, and this is worth doing, because if one is simply playing D&D as a way to fight goblins in a cave without asking why there are goblins, why there's caves and what these things might look like beyond some vague pastiche of Tolkien and 80's children's cartoons one is missing out on a great deal of fun. Not familiar with it, but again this article isn't really about OSR goblins/goblin reskins or stand-ins - it's about the apparent lack of these simple steps in the "mainstream" 5E community. Not sure the post will make it out to that gang, but I do hope it does - the fix is easy. I turned my gobbos from "XP fodder" to "something interesting" by making them highly mutable in my games. The barest amount of magical tinkering will produce a wonderful variety of horrible little monsters. The mechanical difference between a Small shortbow and a hairless mutant spitting acid is pretty negligible, but the PC's reaction is quite different, and it also gives every wizard worth his tower a nest of rainbow-colored sins-against-creation in the basement, to be appeased with shinies or food or affection. There's plenty of room for "design space" in 1hd packs of critters, and after one MU was melted after he let his torch burn out, the rest of the party developed a healthy respect for goblins. Get creative, get weird, and don't be afraid to cause grievous bodily harm to PC's who wander off by themselves. Of course, re-skinning monsters is a basic and key step to monster design and placement, and likewise of course it's possible to run an encounter with 1HD enemies that's dangerous. My issue is with the claimed default play-style in (presumably) 5th edition and its presentation of goblins that leads to risk free, time wasting and uninteresting encounters. 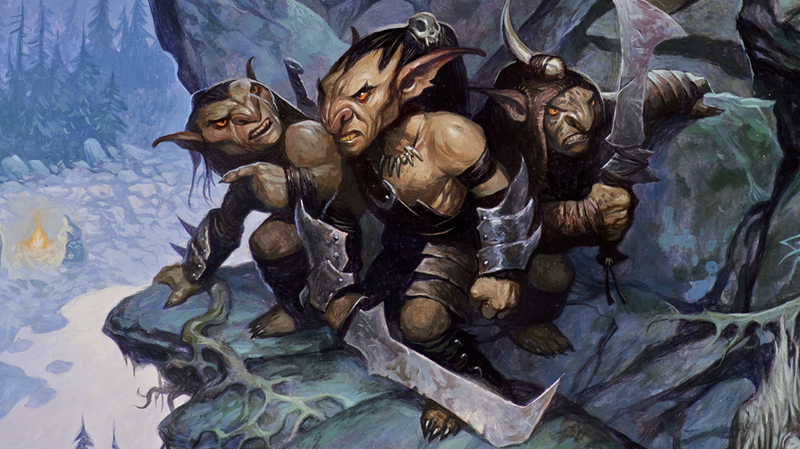 It's weird, but having run Pathfinder, their version of goblins always seemed to be risk-free, time-wasting, but INTERESTING. It might have just been the way that I ran them, or the way they presented them, but every goblin encounter I ran was predicated on EVERY goblin did something interesting on EVERY round. Ideally, the action was reckless, vicious, and violent, but tactically sensible wasn't anywhere in the top five. It made my players LOVE goblin fights. The goblin might chase a chicken with a meat cleaver, or shove a gnome into a well, or bite a villager's arm. It might actually attack them, but it would usually do so either in a memorable tactic (trying to set them on fire or something) or in a memorable way (singing spontaneously composed snippets of song while doing so). 5e, unlike GURPS, for instance, doesn't have a lot of leeway for low-level monsters to vary their combat effectiveness from moment to moment, but well-written (not designed) opponents can be fun for the group even if their actual numerical fight performance is just subtracting their hit points over x number of rounds. I'm not sure, however, that 5e gives you much guidance there either. Monster presentation seems extremely brief--so the DM who knows how to make encounters interesting CAN do so, but the DM who is learning doesn't get any help. Points well taken. I think there's something to be said for wedding concepts to mechanics---like I can just say your thief does a backflip over some guy's head before delivering a backstab on him and you might feel really cool, but the feeling of accomplishment when you roll acrobatics and beat a DC 25 to "really" pull off that flourish is something--to me at least. That's why I can never really feel happy with "reskinning"---like, these are my Guano Golems, stat as goblins; I'm never happy with 'divorcing' mechanics from the imagined world in the game I guess. But I agree that it's a shift in thinking not edition or mechanics that makes all the difference. When you treat monsters as "mobs"---mere obstacles, in other words--you lose out on infinite possibilities that enrich the game. Of course sometimes you're feeling the session needs a little flight-or-fight spice so a purple worm bursts through the wall. But intelligent monsters being used like that always smacked of wastefulness to me. I tend to agree that mechanics and playstyle are coupled. This is precisely part of the problem that D'Anastasio identifies. The visual interest and evocative details of goblin encounters are simple to bend, change and warp to make them less dull - but as long as the mechanics and default vanilla setting promote the massacre everything encountered the combat interaction will remain the default, dressed up a bit, but still repetitive. This is why breaking free of either the specific mechanics (e.g. making low level enemies far more risky) or general play locus (making combat encounters less automatic/desirable)is also necessary. As to re-skinning - there's nothing that says you can't modify things to make them slightly different (e.g. give the guano golems a stinking miasma effect or something)to offer a distinct feel, but it's not going to matter if the distinction is purely cosmetic - D&D's goblins have nothing distinctive that requires them to be orange pointy-earred guys rather then ratmen, feral children, or evil toys possessed by a poltergeist. I always describe goblins as looking like "deformed children suffering from some sort of skin disease" or variants of the same. I also try to make encounters more meaningful with these lesser enemies. I like running a game with seasoned players and watch them try and figure out exactly what creatures they have encountered. Being more tactical minded (and loving the streamlined rules in 5e), I also appreciate the small tactical nuances given to almost every monster with the addition of "traits." For example, the Goblins have the Nimble Escape trait. This allows a bonus action to Disengage or Hide on each of their rounds. In practice, this allows Goblins (MV 30) to rush in, attack, Disengage (which does not provoke an opportunity attack) and maneuver to a potentially more defensible position/ambush, or at least out of range of the PC's melee counter-attack. It could also be used to lure the PCs into an ambush or volley of missile fire etc. Kobolds can utilize their trait called Pack Tactics. This gives them Advantage on attack rolls if the target of their attack is within 5 feet of an ally. The Kobolds in the back rank would get advantage with their missile fire while the front rank is engaged in combat. This is a nice little tweak and potentially makes these critters more interesting (dangerous) to combat. Orcs have the Aggressive feature, which gives them an bonus Dash move each round. This allows for flanking, encirclement and potentially terrifying shifts in combat momentum. Bugbears can be lethal if attacking with surprise, adding an extra 2d6 to an already brutish attack. PCs may want to consider counter measures such as defensive terrain, reach weapons, readying actions and consideration of their own "run-away" options. Ha. "Tucker's kobolds"...that's the first time I believe I've seen that. It's funny how interesting "boring monster" encounters can become when you just start exploring the possibilities of their use...and how deadly. Often it starts with just having them act in numbers. Packs of any type of monster tend to be difficult and dangerous in cramped (dungeon) confines...places where that wand of fireballs can't be employed. Fatigue rules (present even in B/X) can bring a fear factor to warriors whose sword arms are tired from slaying relentless, "weak" foes. However, the things that make goblin combat bearable, even interesting, in B/X...reaction, group rolled initiative, morale rules which speed combat...may not be present in the latest edition of D&D, which appears to be what Ms. D'Anastasio plays (judging by her notes about initiative). Her complaint, with regard to bland mechanics, is one of system. After all, early editions allow ready access to the "sleep spell," perfectly made for dealing with such low-level mobs...so long as one is tactically sound about when to use it. But you're right: the issue of bland monster could easily be rectified with a little imaginative re-skinning. It seems like a really weak-sauce complaint to me. But then, from the dozen or so comments I perused, it appears there's a lot of "inside the box" thinking going on here. Oh I don't disagree that making fights with weak enemies interesting is possible, but I do think the "goblin fight" is a problem of d&d design, not because goblins can't murder characters (Trey of the excellent Sorcerer's Skull reports that nominally well run Phandelver goblins can just about TPK some PCs), but because the fights are being run badly. It's bad GMing, both a lack of trying to evoke wonder and axlack of having enemies utilize the fictive postioning that tabletop allows and excels at. When tabletop encounters are treated with videogame logic they are boring, because what takes 30v seconds to "grind" in a videogame takes 20 minutes or more for every player and the GM in tabletop. It's inside the box thinking for sure, but worse - wrong box. I like the idea that goblins don't like to fight. All to many encounters assume the monster exists to fight the characters, but a runt would probably prefer to do something else. I'd be saying you made a mistake even bothering even giving ten seconds of your time to a rag like Kotaku, but your post is good nonetheless.